James Gray’s The Lost City of Z is an anti-period movie. In the vein of The Immigrant, Gray’s glorious last film, Z is fascinated with its milieu (this time we begin across the Atlantic in Blighty, from 1906 to 1925) and luxuriously adorned with period detail—but the strangulated social climate and physically claustrophobic spaces of its ostensibly sophisticated Western society make that environment appear totally unappealing. Only once we reach the Amazon, untainted by Western hands, does the film relax, its beguiling score and open-air scenery turning inviting. There, in a land of uncomplicated tribes and indifferent wilderness, a man like soldier and explorer Major Percy Fawcett (Charlie Hunnam) can find freedom from the narrow-mindedness infecting early 20th century Britain. Because he has been “rather unfortunate in his choice of ancestors” (the film’s killer line, delivered by Murray Melvin of Barry Lyndon, thematically a forebear through its own depiction of European high society as a finely filigreed social warzone), Fawcett first leaves his wife (Sienna Miller) and children behind in England for a spot of survey work in “Amazonia.” He believes his success will atone for his father’s mistakes as a gambler and a drunk. On his first South American voyage, Fawcett finds clues that suggest an ancient civilization once stood in the middle of the supposedly barren rainforest. Initially obsessed with elevating his family’s status, Fawcett returns to the Amazon again and again, gradually consumed by the idea that “Z” might cure his own personal dissatisfaction, trapped by the jungle’s unfathomable lure. In an about-face from his oft-stiff style, Hunnam easily delivers his best performance, playing a melancholy sort of wannabe-hero, alienated from society prior to his expeditions due to his family’s ill reputation, and after for daring to suggest there might be more to the Amazon than just “murderous savages.” When Fawcett argues back in London for the existence of Z to a gathering of dismissive Royal Geographical Society acolytes, Hunnam commands the room. When the reluctant Major, temporarily blinded by chlorine gas at the Somme (in the brief but vicious battle sequence that closes the second act), quietly weeps upon being told he may never be able to travel to the Amazon again, Hunnam conveys all the explorer’s tragic reliance on the jungle as an escape—from himself, and from the supposedly civilized world that’s never seen fit to accept him. This idea, that a misfit might well dream of another world but never find satisfaction in the reality of it, is a single, simple message to which Gray commits to for all of two hours, 20 minutes. Perhaps inevitably, by the third of Fawcett’s missions, Gray’s film begins to lose some steam. 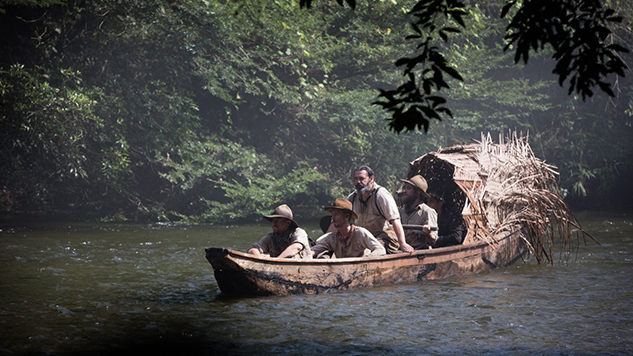 As an older Fawcett and his now-adult son Jack (Tom Holland) traverse the Amazon alone, minus Fawcett’s regular companions Arthur Manley (Edward Ashley) and Henry Costin (a generously bearded and faintly eccentric Robert Pattinson), the touching camaraderie of earlier explorations is lacking. Jack and the rest of Fawcett’s estranged family, perhaps pointedly, are too lightly sketched, their scenes never sharing the same warmth. Sienna Miller is given room to breathe some life into one of her now-customary housebound spouse figures, but Nina Fawcett—a modern woman left to raise the children back home as the Major performs his man’s duty—remains as distant as her husband’s lost city. That the film works so well despite its faults—and Z can be intoxicating—is down to the elegance of the filmmaking. Gray’s DoP plays no small part. Geographically, The Lost City of Z recalls Werner Herzog’s two great Amazonian adventures and that other riverbound jungle journey, Apocalypse Now, but Darius Khondji’s stately, golden-hued imagery constantly brings to mind Vilmos Zsigmond’s lugubrious photography in Heaven’s Gate. There are remarkable images here: a running trickle of alcohol segueing into a shot of a steam train hurtling through the jungle; an infant Jack, half-remembered by his father during one of his missions, standing in a sun-dappled English field; not to mention a bewitching final shot which lends the occasionally too-literal film some lingering ambiguity. Khondji’s cinematography doesn’t just complement Gray’s movie, it deepens its meaning, strengthening the appeal of Fawcett’s jungle, endlessly verdant and mysterious where home in England appears dull and monotone. Every frame is sumptuous and misty-eyed, always pining for a lost era when adventurers might still find corners of the Earth completely untouched. (Gray may show little love for Empire, but he depicts colonial exploration in itself as a romantic adventure.) The film doesn’t make for much complexity, but it feels deeply. Like Fawcett, it aches—like his obsession, the jungle, it envelops, casting a lasting spell.